The deteriorating situation in China, a market that businesses around the world rely upon for growth, has spooked investors and prompted warnings from top companies like Apple. 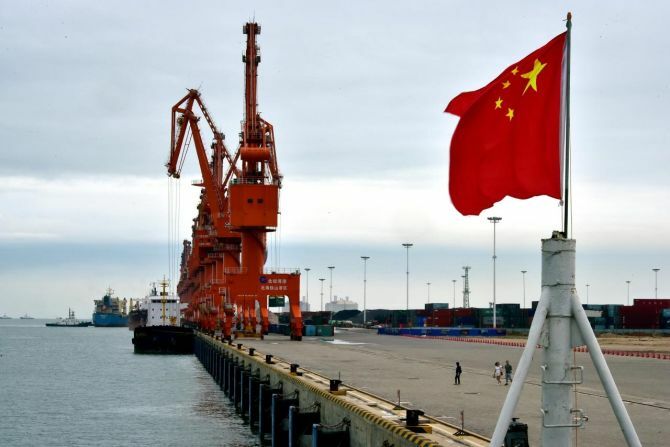 In the three months to December, the economy grew 6.4 per cent from a year earlier, down from 6.5 per cent in the previous quarter, China's National Bureau of Statistics (NBS) said. The NBS announced on Monday that Chinese economy grew at 6.6 per cent in 2018. The 6.6 per cent is above the official target of around 6.5 per cent, according to the data published the NBS. Growth in the fourth quarter came in at 6.4 per cent, down from 6.5 per cent seen in the third quarter, it said. Last year, US President Donald Trump imposed tariff hikes of up to 25 per cent on $250 billion of Chinese goods. The move prompted China to increase tariffs on $110 billion of US goods. China's rate of expansion has raised worries about the potential knock-on effect on the global economy. The trade war with the US has added to the gloomy outlook. It has spooked investors and prompted warnings from top companies like Apple. Indicating the slowdown, China has last week announced a lower base for 2018 GDP by scaling down the GDP growth for 2017 from 6.9 per cent to 6.8 per cent. The GDP was 82.08 trillion yuan ($12.13 trillion) in 2017, down 636.7 billion yuan ($93.9 billion) from the preliminary calculation, the NBS said on Friday. Monday's new data confirming the slowdown of the economy came ahead of key talks between top trade officials from the US and China in Washington on January 30 and 31. The talks will be held between Chinese Vice Premier Liu He and US trade representative Robert Lighthizer to work an agreement before the March 1 deadline failing which President Donald Trump has threatened to slap additional tariffs on all Chinese exports to the US. The two officials would review the recent official level talks on a host of issues to work out an agreement to end the trade war. Officially China played down the slowdown saying that the country achieved its goal of around 6.5 per cent GDP growth set for 2018. According to the new figures Chinese economy achieved a 6.2 per cent industrial output growth last year, compared with 6.6 per cent in 2017. Fixed-asset investment growth was 5.9 per cent last year, 0.5 percentage point higher than the first three quarters of the year. Retail sales increased by nine percent in 2018 year-on-year, down from 10.2 per cent in 2017, the NBS said. The number of newly-created jobs in urban areas reached 13.61 million in 2018, one lakh more than the previous year and surpassing the government's annual target. China's surveyed unemployment rate in urban areas stood at 4.9 per cent in December, 0.1 percentage point lower than that in December of the previous year. The rate remained below the government's target of controlling the surveyed urban unemployment rate within 5.5 per cent in 2018, state-run Xinhua news agency reported. China's economy faces downward pressure and there would be targeted solutions to the challenge, the NBS said in a statement. Trump has been pressing China to bring down the $375 billion trade deficit with the US, which he attributes to unfair trade practices by Beijing. Trump had earlier warned that if a deal is not reached by March 1, the end of the 90-day grace period, the US will hike the tariffs on the $200 billions of goods from 10 per cent to 25 per cent. Last December China's exports fell to $221.5 billion registering biggest plunge in two years amid the trade war with US.